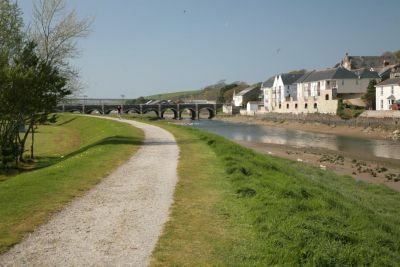 One of the earliest recorded references to the town of Wadebridge was in 1313 when a market and two fairs were granted to Wade, within the manor of Pawton. 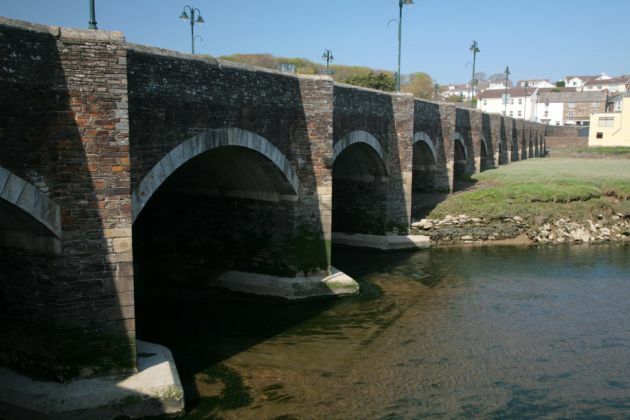 At this time the town was in two parishes, Egloshayle and St Breock, on opposite sides of the River Camel. At this time, there were also two chapels, St Michael’s was on the west side of the river and King’s Chapel was on the east. 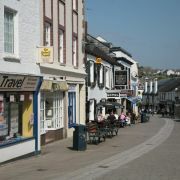 Wadebridge was originally a market town but later became a foundry town. Its fifteenth century bridge across the River Camel is worth a visit. 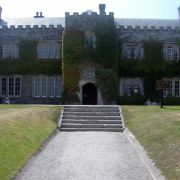 It was built by the Reverend Lovibond in 1460 and has seventeen arches along its 320 foot length. 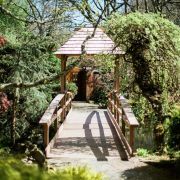 Legend says the bridge was built on wool, as this was where the wealthy landowners who paid for it had made their money. 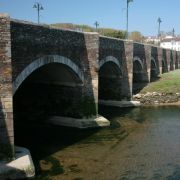 From the time this bridge was built the town became known as Wadebridge. 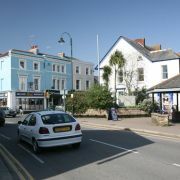 The Town Hall was opened on 31st May 1888 by Sir Paul Molesworth. 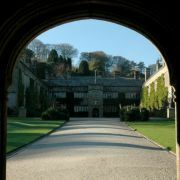 It was originally called Molesworth Hall and cost £3000 to build, an enormous amount in those days. The Hall was eventually taken over by the Parish Council. At the rear of the Town Hall is a large mural painted showing the building of the bridge. 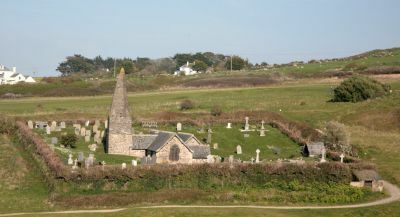 The two main churches are not in the town itself but have evolved from the original chapels, on the outskirts of Wadebridge. St Breock Church stands in Nancient, meaning holy well in Cornish. Egloshayle (from eglos meaning church and hayle meaning estuary in Cornish) Church stands on low ground near the river and is dedicated to St Petroc. The church tower is 80 feet high and was a gift from the Reverend John Lovibond, builder of the bridge. 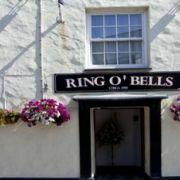 Both Wadebridge and nearby Camelford are good centres from which to explore the surrounding hills and moors. 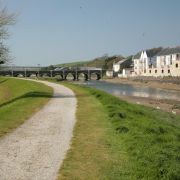 Both are convenient for the Camel Trail, a walk and cycle track following the old railway route from Bodmin to Padstow. 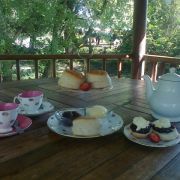 There is attractive scenery and plenty of wildlife to be seen along the peaceful trail. Cycles can be hired locally. 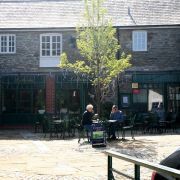 Wadebridge has a new leisure centre, including a swimming pool, squash courts, weights room, café, solarium and main hall, in which various other activities take place. The name Camel has nothing to do with the humped animal, although many local organisations have picked up on this. The name in fact comes from the Cornish for elbow and at some point in the past it was decided the geographic shape of the river from Wadebridge to the Atlantic closely resembles the shape of an elbow! Further along the river near Rock, stands the little fifteenth century church of St Enodoc. 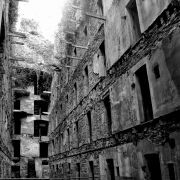 As the building was almost buried in the sand for years, it was often necessary to enter through the roof for services! As a result of this, the church was once known locally as 'Sinking Neddy'. However, the sand was cleared away long ago and St Enodoc is most famous these days as the last resting place of the former poet laureate, Sir John Betjeman. 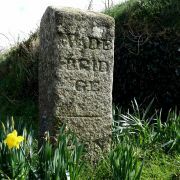 The old Wadebridge Railway Station, closed in the 1960s has recently become the John Betjeman Centre. Wadebridge is the site of the Royal Cornwall Show each June. 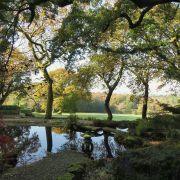 This is one of the largest agricultural shows held in the United Kingdom. 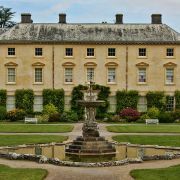 There are exhibitions, competitions, displays and lots of different events – something for everyone of every age. 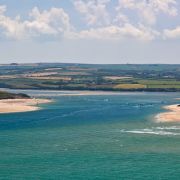 Not far away is the better known resort of Padstow.